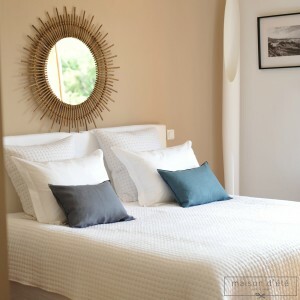 Maison d'été offers you a large selection of bedspreads: Provençal quilts, bed throws and bedrunners. They are all made from fine natural materials - linen, cotton or stone washed cotton. You'll find different traditional and contemporary styles and dimensions, so you can cover your bed with matching colors. All our Provençal quilted bedspreads are machine washable on a delicate cycle, making them easy to use. There are matching pillowcases for each bedspread. You can even add a matching eiderdown quilt. A bedspread adds the finishing touch to your bedroom decor, making your bed an elegant, welcoming place. Come and visit our outlets to see our collection of blinds. This bedspreads, with its graphic motifs, will marry perfectly with white percale comforter cover. The contrast between gray and white is very soft and at the same time very bright. This white cotton bedspread with black satin stitch embroidery is very simple and elegant. Impeccable and easy maintenance. An essential that we do not get tired! This white cotton bedspread with natural polka dot stitching will add simple beauty to your bed with its fine natural satin stitch embroidery. It's very discreet and elegant. A beautiful white cotton bedspread with its fine natural satin stitch embroidery and enhanced by a natural surround. A two-color effect discreet and elegant. This white and gray cotton Louise bedspread will transport you into a world of refinement.